Before he was a very good Tyrone footballer, Padraig Hampsey was a very good boxer, good enough to win two Ulster underage titles and contest a national final. The renowned Frank Gervin was his trainer and Conrad Cummings, since a European champion, was a Clonoe club-mate. All around him growing up, there was boxing stardust. But the lure of Tyrone football can be strong and eventually Hampsey's head was turned. Still, what he learned between the ropes stands to him when he takes to the field. Hampsey's warrior instincts are a trusted commodity in any Tyrone plan these days, his nerve for one-to-one combat regularly sees him delegated to take on the most onerous tasks. On Sunday it was Conor McManus he was detailed to track and while McManus had success with an early point and the sourcing of three frees which he converted himself, Hampsey had his successes too. A contest they might have expected to lose convincingly was a split decision at most. Similarly, a week earlier in Ballybofey, he renewed rivalry with Michael Murphy who he had closed down in Clones a year earlier in what was his debut Ulster Championship campaign. Murphy got in for a goal off a fluffed kick-out, caught a few kick-outs further outfield and linked play well when he operated around the middle. But Hampsey's constant presence ensured there would be no renewal of what Murphy got up to in Hyde Park two weeks earlier. Moreover, he turned the tables on Murphy at the other end, getting forward to kick two points, adding to the two he had mined from their duel in Clones 14 months earlier. But, as in boxing, a bloodied nose is never far away, especially when a rampant Dublin team is in the opposite corner. Hampsey felt the full force of that power in last year's All-Ireland semi-final when Con O'Callaghan, who he was picking up at the heart of the Tyrone defence, hung back to exploit a turnover and scythe his way through for that sensational fifth-minute goal. The shock and awe of that goal was something Tyrone just didn't recover from. Last month, when the sides met in their Omagh 'Super 8s' fixture, Mickey Harte detailed Hampsey to track Brian Fenton but the range of movement and dexterity of the Raheny man overpowered him. After Sunday's match, Harte spoke of Hampsey's adaptability and their confidence as a management team "in handing him any task at all", adding he can go various places and put out various fires? Where will the fires burn brightest on September 2? Go back to last year's semi-final and that O'Callaghan goal was its signature. But when Mayo began making plans to take down the champions the brightest blaze was Ciaran Kilkenny whose influence had been all over that 12-point dismissal of Tyrone, touching the ball an incredible 62 times as he shifted it laterally from one wing to another with unfathomable freedom. In the eerie silence that so often provided a backdrop that afternoon in a stadium packed with 80,000-plus people, the voice of Tyrone selector Gavin Devlin urging his players to put pressure on and push out stood out. Mayo made their biggest statement of all, deploying Lee Keegan to track him everywhere to the extent that Kilkenny enjoyed only a third of the possession he had in the previous game. Keegan has more mental resolve than arguably any other defender in the game and executed one of the great containment strategies. 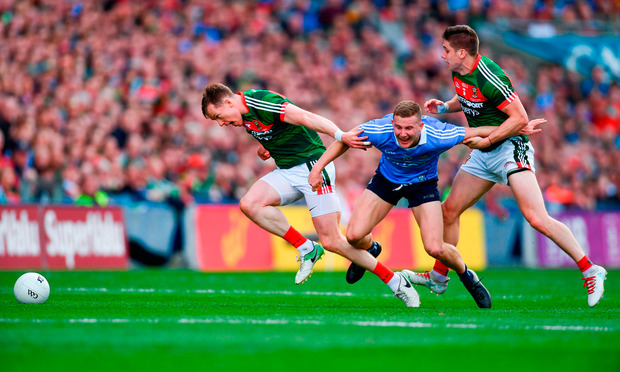 Of course, some of the fires that blazed elsewhere were unquenchable but Mayo's attempt to stop the Dublin machine at source came arguably closer than ever to working and there has to be a lesson in that for Tyrone. In Omagh last month Kilkenny, as he had done in the league match last February, spent a lot of his time in the full-forward line before drifting further outfield for the second half when he had Conor Meyler for company. When they played Donegal a week earlier Eamonn Doherty was Kilkenny's tracker and while he lost the verdict it was a points defeat more than a knockout. Kerry too have had success with Tadhg Morley's robust approach on Dublin's orchestrator-in-chief in both the regulation league match in Tralee and the league final in Croke Park last year. But Kilkenny's influence remains as strong as ever. He's a prime candidate, along with Fenton, for Footballer of the Year and Galway's decision not to prescribe a perpetual shadow for him was, ultimately, a costly one. It may be time to test Hampsey's "adaptability" once more. Getting to grips with Kilkenny alone won't even get Tyrone close to Dublin. There are so many other strands to it. As Harte acknowledged after Sunday's semi-final win they'll need everything to go right for themselves and quite a few things to go wrong for Dublin, wishful thinking in the current climate. Tyrone's absence of a real presence in their full-forward line doesn't help their cause. 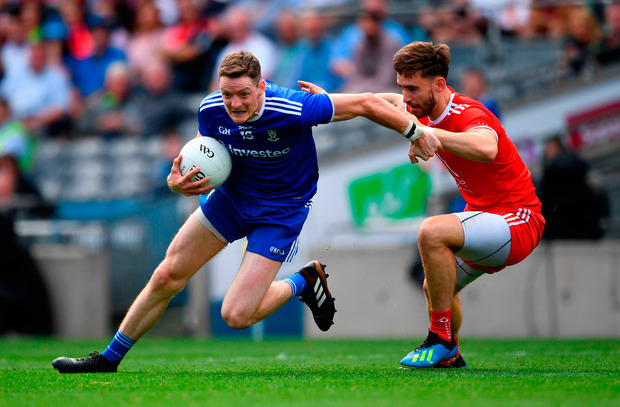 When the reigning champions have looked troubled this year, however briefly, the source of that trouble has been a player like Damien Comer, Donie Kingston or Patrick McBrearty coming out to meet the ball. Tyrone don't have that kind of artillery which leaves them with a challenge to get numbers ahead of the ball. How do they deal with the Stephen Cluxton kick-out that was lost just twice on Saturday night and was simply impeccable in the second half of last year's All-Ireland final? This time last year they were considered the perfect model to counter Dublin's game with their solid defensive platform. Three defeats later, that narrative has changed. "We have to do our very best to make a game of this final. The public need it and Tyrone people need it to make us take a bite at this final," said Harte on Sunday. Kilkenny must be their first port of call. Martin Breheny Jim Gavin would have known it was coming, so now the challenge is how to deal with the opposition's mixture of flattery and mischief. Donnchadh Boyle It was a swift but natural progression. Conor McKeon JUST four teams can credibly challenge Dublin for this year’s All-Ireland SFC title, according to Kieran Donaghy.